Its Return? | There once was a creek . . . The return of Western Creek? 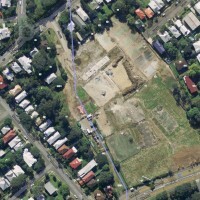 Western Creek, as it once was, is gone. Except in a few small pockets at the top of the catchment, the original channels have been buried and the native vegetation removed. In its place are houses, roads, businesses, recreational spaces — all vital and well established pieces of community infrastructure. But the story of Western Creek is not necessarily over. There are places where, given the will and the resources, a natural channel could be restored without impinging on existing infrastructure and land uses. And over time, shifting land uses and community values may present other opportunities that might not be entertained seriously today. But why expend such effort just to undo the hard work of previous generations? After all, they must have had good reasons for doing what they did. Well, yes, but they were operating under very different circumstances and attitudes from those of today. Prior to urban development, most of the Western Creek catchment was cleared for farming, primarily grazing but in some places also for orchards and crops such maize, lucerne and cotton. By the time the waterways came to be re-engineered, they probably would have been cleared of vegetation and polluted by human or animal waste, leaving them with little ecological or aesthetic value. As urban development proceeded, these waterways would have been viewed as a nuisance and a hazard, not to mention an obstacle to the construction of roads, houses and other infrastructure. Filling in a stream (or an entire swamp, for that matter) would have been a mark of progress — a way of improving public safety and facilitating more ‘productive’ uses for the land. 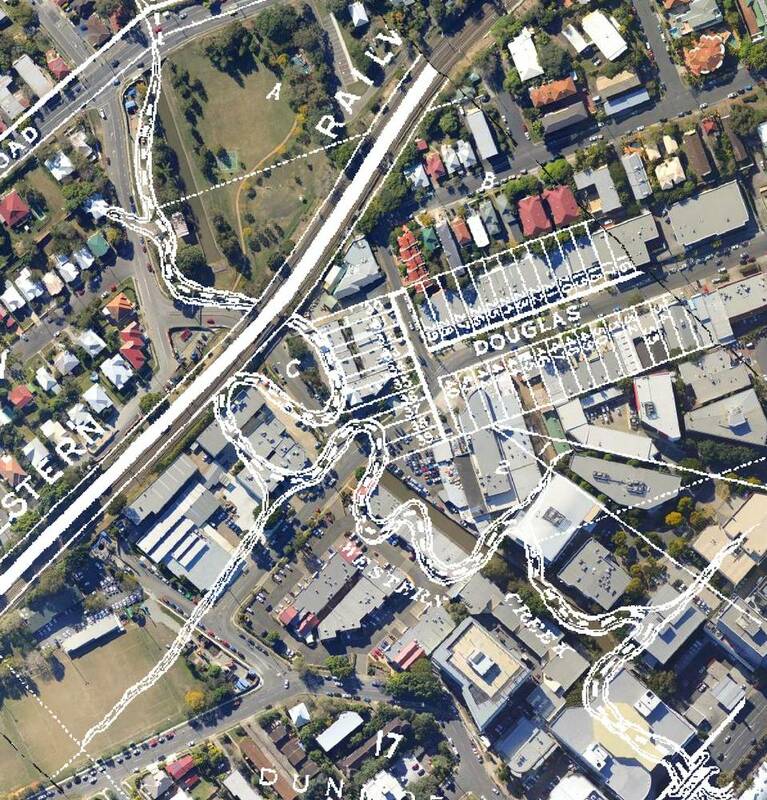 You only need to look at the map showing the old path of the creek through Milton to see how much urban footprint can be gained by not having to build around a natural channel. Nowadays, urban design philosophies (at least in some quarters) have come full circle. New developments espousing the principles of water sensitive urban design aim to retain or recreate natural waterways as an integrated part of the urban water cycle. And in many established urban areas, concrete channels are being turned back into natural channels, often with great success. An excellent example close to Western Creek is the restoration of ‘Frog Creek’, a stream flowing past Bowman Park into Ithaca Creek. In a surprisingly fast time, this stream was transformed from a bare concrete channel into a flourishing creek surrounded by native trees and teeming with frogs, lizards and other wildlife. 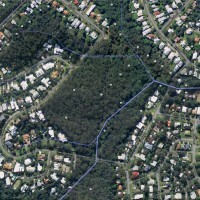 Other examples of completed or ongoing stream restoration projects in Brisbane include Yooralla Street West in Enoggera Creek, Bridgewater Creek Wetland in Coorparoo, and at the whole-of-catchment scale, the Norman Creek 2026 project. In an ocean of urban development, healthy creeks are islands of biodiversity, providing habitat for all kinds of animals as well as sanctuaries for nature-deprived urbanites. Healthy natural channels also promote better water quality through the filtration of nutrients and sediments. However, the considerable aesthetic, recreational and ecological benefits from restored streams do not come cheap or easy. A successful restoration project requires careful planning and design, and considerable resources from both government and the community to carry out the initial excavation and planting and then the subsequent maintenance while the new ecosystem becomes established. So a certain degree of conviction and commitment from all relevant parties is needed if a project is to get off the ground. 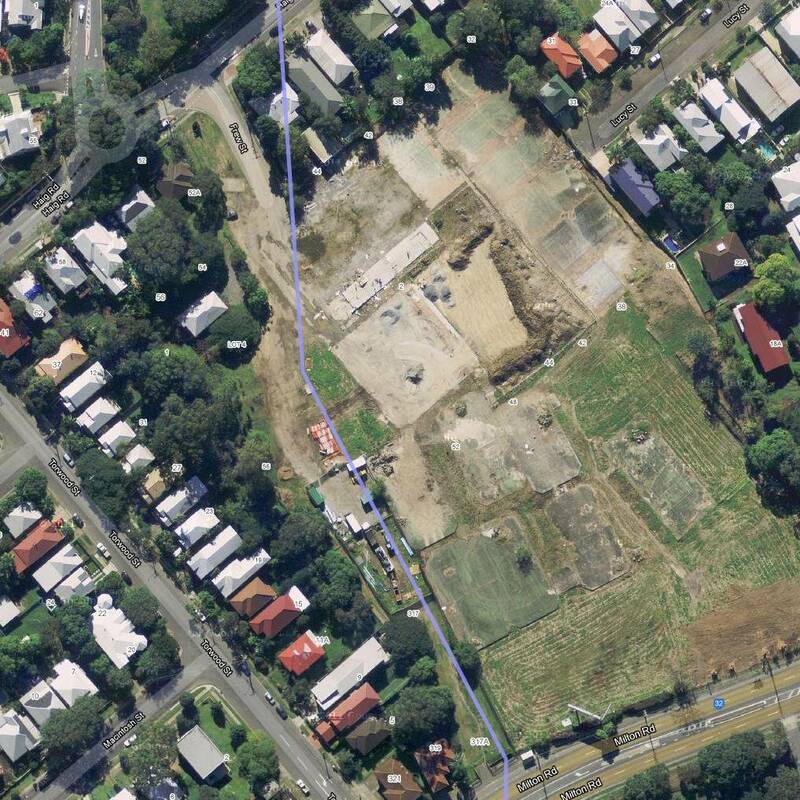 With all that in mind, here are some of the bits of Western Creek that potentially could be restored. These are just sketches, not proposals, and I am assuming nothing about how realistic or even desirable they might be. If you have any thoughts, do share! 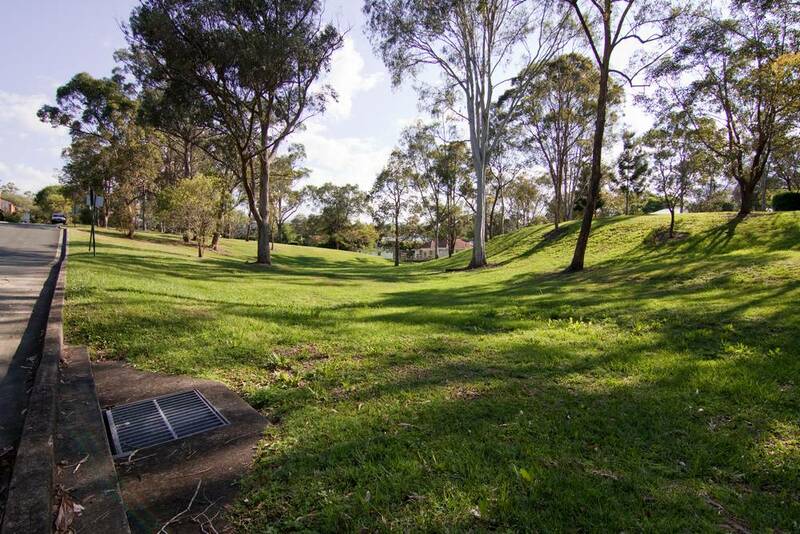 If there ever was a genuine opportunity to restore a part of Western Creek, then the redevelopment of Frew Park is surely it. The Council essentially has a blank canvass on which to create a new landscape, subject to a few constraints (as described in the October 2011 newsletter). During community consultation about the new park, the option of restoring the creek or a lake was indeed raised. The Council’s concern with this option (also stated in the newsletter) is that an ‘acceptable’ water quality might not be achieved. 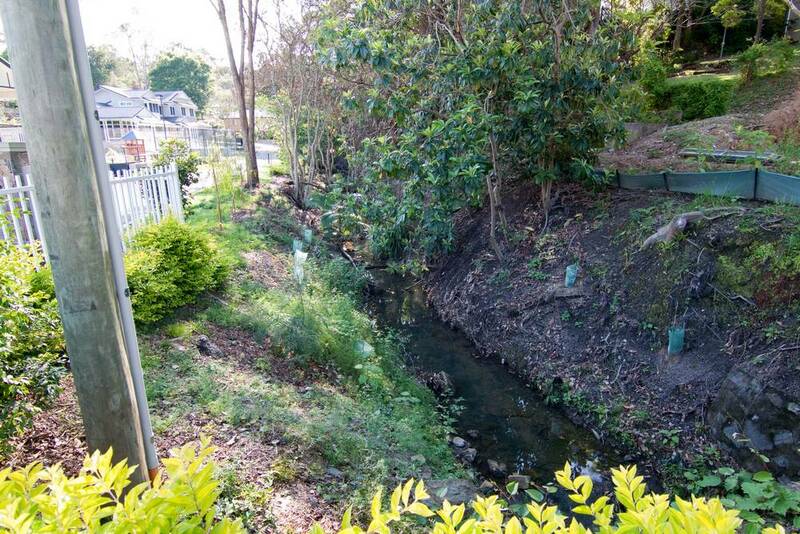 This section of the creek is tidal, so the water in it would be primarily the salty, silty soup of the Brisbane River. At low tide the creek would most likely be a bed of mud and mangroves — all very natural, but potentially not what park visitors and nearby residents would want to see or smell. Then again I’m not very familiar with tidal creeks, restored or otherwise, so I confess I don’t have a good feel for how it might work out. 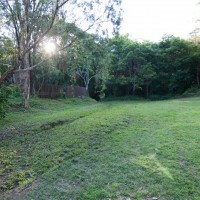 Ironically enough, a resurfaced creek did feature in the plans for the high-density housing development that was proposed before Council decided to buy the park instead (you can look it up via the Council’s Planning and Development site). 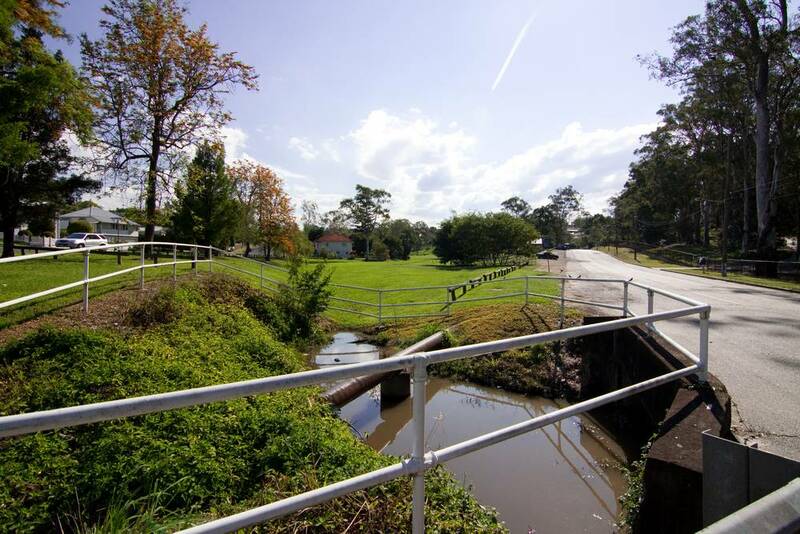 Whether that development would have attempted to make a natural channel, or just a more presentable extension of the Milton Drain, is not clear. 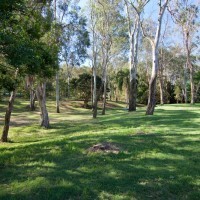 The draft concept plan for Frew Park, released by the Council February 2012, confirms that this part of the creek is destined to remain underground for the foreseeable future. Perhaps the least the Council could do is to incorporate some sort of homage to the creek in the design or decoration of the park and its facilities. 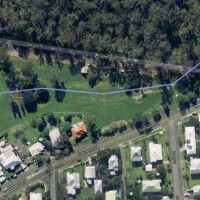 At the corner of the Governor’s House property bordered by Murruba Street and Baroona Road, there is an area of lawn that is mostly flat except for a large indentation running through the middle. 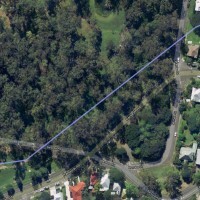 The indentation runs from the culvert under Murruba Street to the pond near Baroona Road. It is the ghost of the old stream, left visible because there was no need to level the ground above it — no need, because this piece of land is not used for anything. 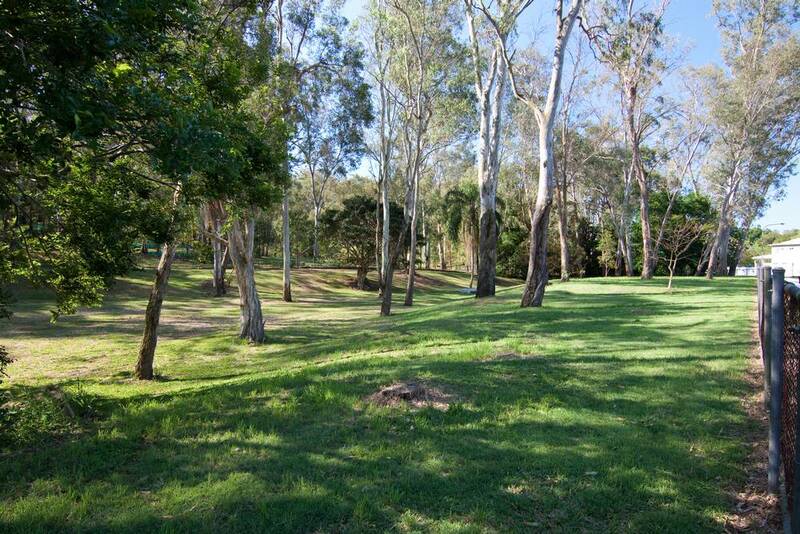 It has little in the way of biodiversity value, as it is basically a lawn with a few trees. It has no gardens, gazebos, tennis courts or other such facilities found elsewhere on the grounds (I certainly haven’t noticed the Governor trouncing about there recently — have you?). 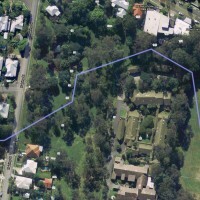 And like the rest of the property, it is off-limits to the public — even, I suspect, when the gates are opened on Australia Day, as there is a fence separating this area from the rest of the Fernberg Property. To me, this all begs the question — why bother fencing this area off from the public at all? Why not open it up as parkland that the public can enjoy? And imagine how nice it would be if there was a creek running through the middle! Heck, throw some barbecues in for good measure. The pond near Baroona Road is a tease, inviting us to imagine what could be made of the rest of this land. Of course, this is private property. And for all I know, the chances of it being opened to the public might be zero. Even so, I think a restored stream here could do a lot to enrich this part of the catchment, and to remind people that there once was a creek flowing through their neighbourhood. 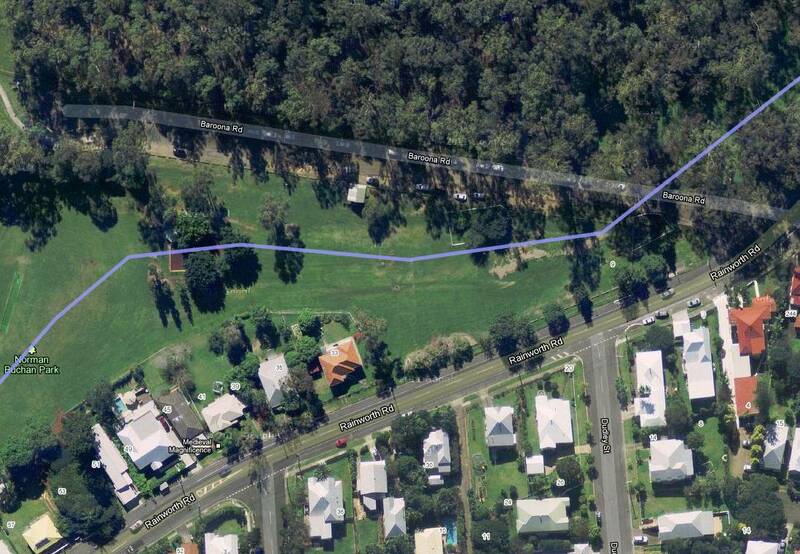 The ‘pointy end’ of Norman Buchan Park, where it narrows towards the junction of Baroona and Rainworth Roads, is not a very useful part of the park. There is barely enough room to throw a Frisbee, and you probably wouldn’t want to try to catch one anyway because the ground is uneven and often boggy. And there is a rather uninviting, weed-infested pond at the culvert under Baroona Road. There is, however, enough room for a creek, and just importantly, some trees. I’m not sure exactly what path it would take. 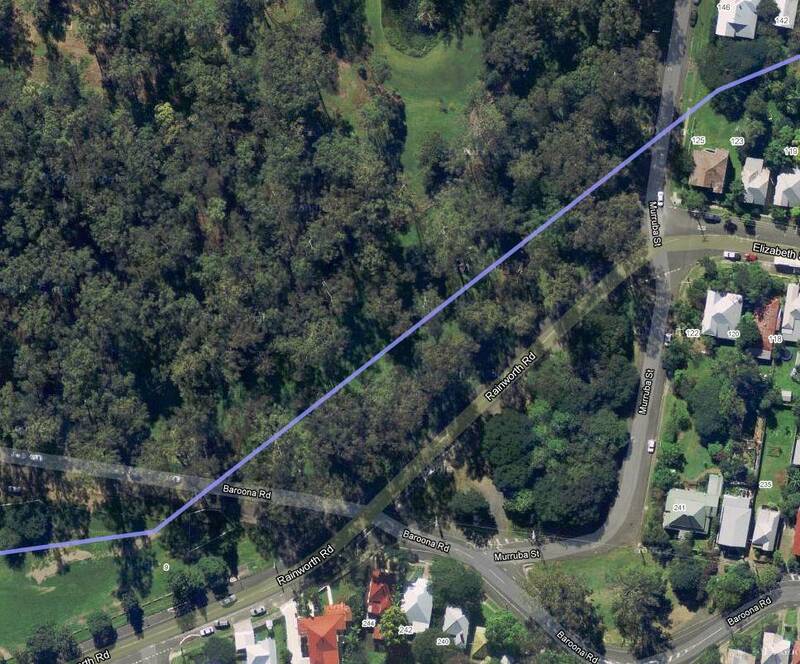 On the one hand, the existing contours suggest veering towards Rainworth Road; but on the other hand it would make sense to join up with the open drain further down Baroona Road. Perhaps you could take a meandering route (as the original stream may well have done) and do both. Somewhere though, a transition back to the underground drain would be needed, probably some distance before reaching the small playground area. Any further, and the stream would interfere with other established uses for the park, most obviously the cricket field. Conceivably, the stream could be opened up at the upstream end of the park as well (just under the roundabout), but this area is arguably of greater value in its current state than the downstream end. I don’t know much about this park. Despite living in Bardon for most of my life, I never really noticed it. And in my recent visits I’ve rarely seen anybody using it. All in all, I suppose it is a pretty unremarkable park. I have a strong memory of it though, from the first time I retraced this part of the creek. Walking into the park from round the bottom of retirement home, and seeing the contours of the buried stream, I couldn’t help but think how pointless it seemed to have a plain old lawn where there once was a creek. 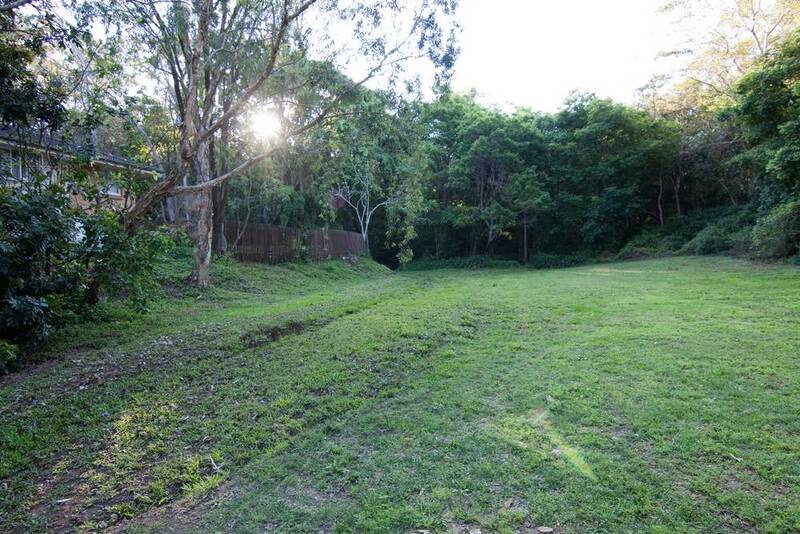 And like the lawn at the bottom of Fernberg, I still can’t help but imagine how special this park could be with a creek running through it. Rainworth Park, where you can still see the contours of the old stream bed. Admittedly, a stream here would be only a short fragment, which may call into question the value of restoring it. And being high up in the catchment, it would flow only periodically, and might even dry out often. That being said, the open creek just across Haining Street does seem to pond up for quite some time after rain. Also worth noting is that the park is close to both this open channel as well as to the bush reserve just a bit further upstream. 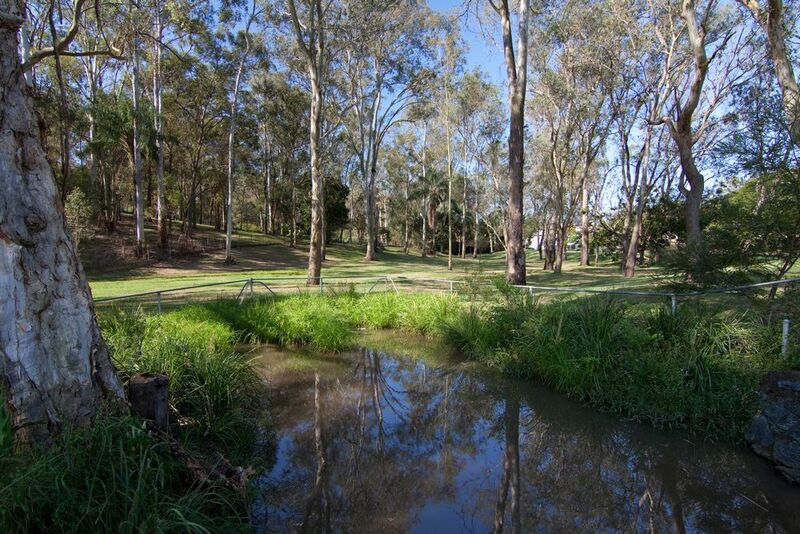 Thus a restored stream at Rainworth Park would have the benefit of some continuity with the most natural and healthy part of the Western Creek catchment. Does anyone go to this place — this little boggy clearing at the bottom of a severed street? Who even knows it exists? Aside from the people whose houses border the clearing, I doubt anyone has much of a reason to come here. That is, perhaps, unless they are inspecting the sewage mains infrastructure that lies just inside bush at the upstream end. I can only assume that this infrastructure is why the clearing exists, but I could be completely wrong. Unlike in the rest of the catchment, the channels in the Weedy Wonderland have not been buried, straightened or lined with concrete. But like the bush around them, they are choked with weeds. I haven’t learned much about the history of this area yet, but I suspect much of it was once cleared and that most of the vegetation is regrowth. Certainly many parts of the Birdwood stream would have been cleared when the large sewage pipe was laid. The weeds invaded, and the native vegetation has not managed to claw its way back in (at least, that’s how it looks to my eyes!). In principle, many of the weeds in this reserve could be removed and replaced with native species. But it would be quite a job, and would require a small army of people to do it, probably with repeated efforts over many months. Having never been involved in such a project, I can only guess as to the nature of the task, and the likely result. This is fascinating work. Thank you. Actually I’m really chuffed to discover someone who has had the same thoughts as me! I live in Beck St and I wish I had somewhere to take my children to see a little bit of a natural stream after the rain that didn’t require a trip in a car. There is something very important missing for kids around here (a connection to nature!) that a project like you are suggesting would help with. Have you read Richard Louv’s books? Maybe some extra arguments for proposals could be drawn from his research? 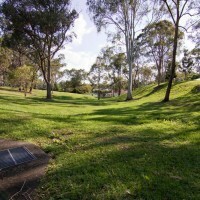 I feel very dissappointed that council haven’t included restoration of the creek in plans for Frew Park. 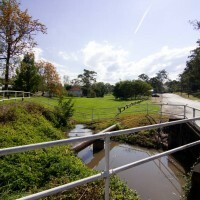 It is funny how everyone thinks the flooding in Rosalie was due to stormwater backflow. Probably a product of this creek being forgotten. The flooded areas matched the original path of the creek perfectly well. By the way, I don’t think mangroves would be necessary/possible as it is unlikely that saline water would still flow back that way now. Something like Melaleuca quinquinervia and M. viminalis (which do have some salt tolerance and were probably the trees that led to the ‘Red Jacket Swamp’ name) would work really well. These plants don’t mind periodic innundation so a mostly dry creekbed would be no problem here. I would love to help you anyway I can with any restoration project. My background is in envionmental science / botany. I’ve been involved in a couple of creek restoration projects. 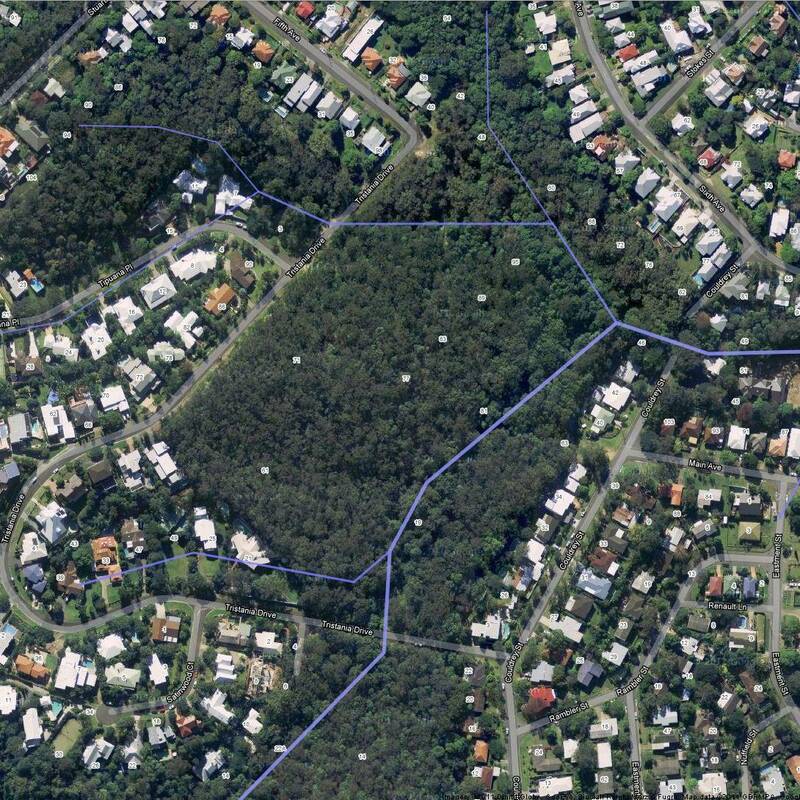 Actually I surveyed the trees and other vegetation in the Fernberg site for my honours project on the impact of urban development on brisbane’s bushland. The largest trees I found adjacent to urban development are on this site. There are some very old red gums below government house. 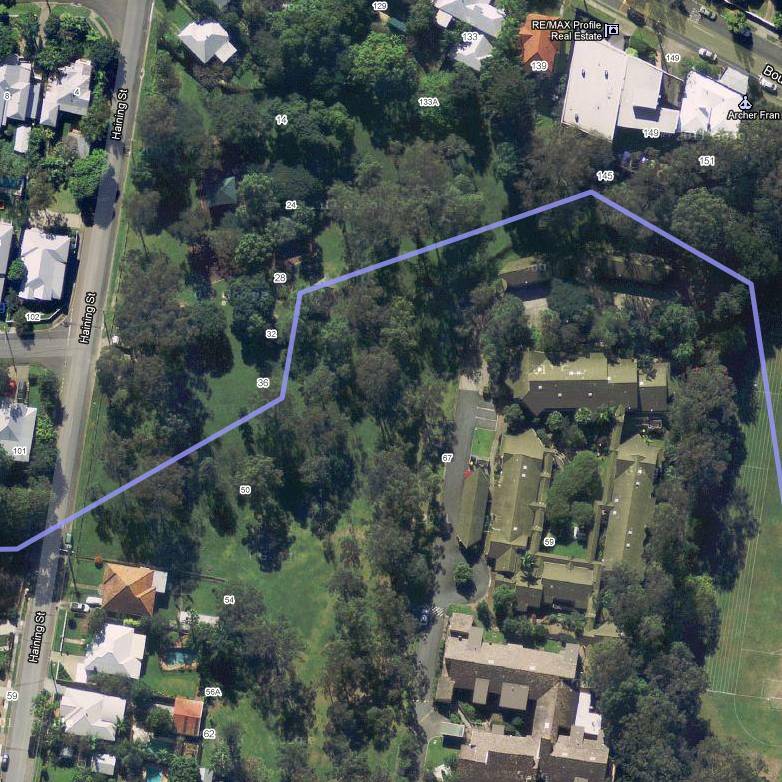 The government house manager at that time was not very interested in maintaining the site in any natural condition. However, I still think that there might be a chance to have some restoration project on this site. They could well open up the lower section to the public along the ‘creek’. The sites further up would be also very possible. Maybe a group like Ithaca Intact could help with any project proposal. Thanks for your thoughts, Kate! Good to know that you have some botanical insights into the area, as I have no expertise in that field. I’ll be sure to get in touch when I do some more research into Fernberg. Incidentally, the open day is this Sunday, so it will be a rare chance to see the grounds from the inside. 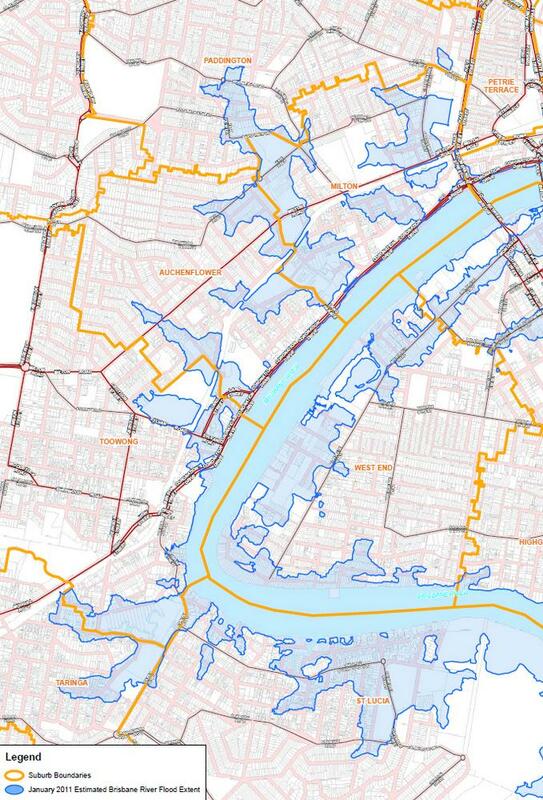 The 2011 floodline did indeed match the Course of Western Creek, as well as other now-extinct watercourses such as Boundary Creek (Suncorp Stadium) and Langsville Creek (down below the Wesley). (This map shows it rather well.) The water did indeed come from the river and through the stormwater drains, but of course it followed the creeks all the same. Perhaps mangroves aren’t the only thing that would grow in a restored creek at Frew Park, but they dominate the bottom of Toowong Creek, so I assume they would tend to do so at Western Creek too. Thanks for your comments, and especially for the link to the Wiki page. When I was researching Gregory Park I found myself thinking at times that you could do a history on its sporting clubs alone. I will definitely try to work in a link or to to your Wiki from the Gregory Park page. And I’m thrilled to see that you’ve done some research on Bowman Park. I’ve frequented that place and the surrounding creek basically all my life, and while I would love to give it the ‘Gregory Park treatment’, I simply don’t have the time. Also, I’m currently doing some research on the early residential estates in the Milton area, so the information you’ve dug up on the Latrobe Estate may prove useful!